I’ve had a couple of people ask me recently how I do my videos on my webpage. So I thought I’d do a post on how I edit my videos. 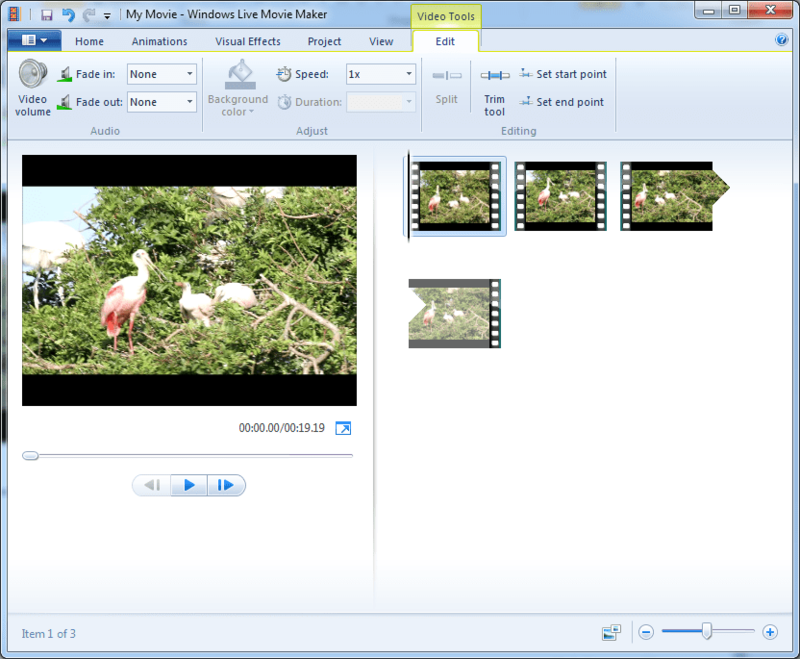 First, download Microsoft Movie Maker. It’s a free add-on to Windows that is part of the Windows Live suite. (You might already even have it on your computer!) I have Version 2011, for Windows Vista and Windows 7. (I have Win7). Next, locate the video that you want to edit. My Canon 7D allows me to record full-res HD video, which it saves to my Compact Flash cards as .mov files. Your movie will show up on the right side of the screen in storyboard fashion. Note that you will probably get a little pop-up window for a few seconds, as the computer pre-processes your video to prepare for quality playback. I usually wait for this message to disappear before I try to continue. You can hit the Play button to view your video as you edit. Also note that there are two timers displayed underneath your video: the time of the current frame, and the total time of your video. Edit them to include the interesting parts. 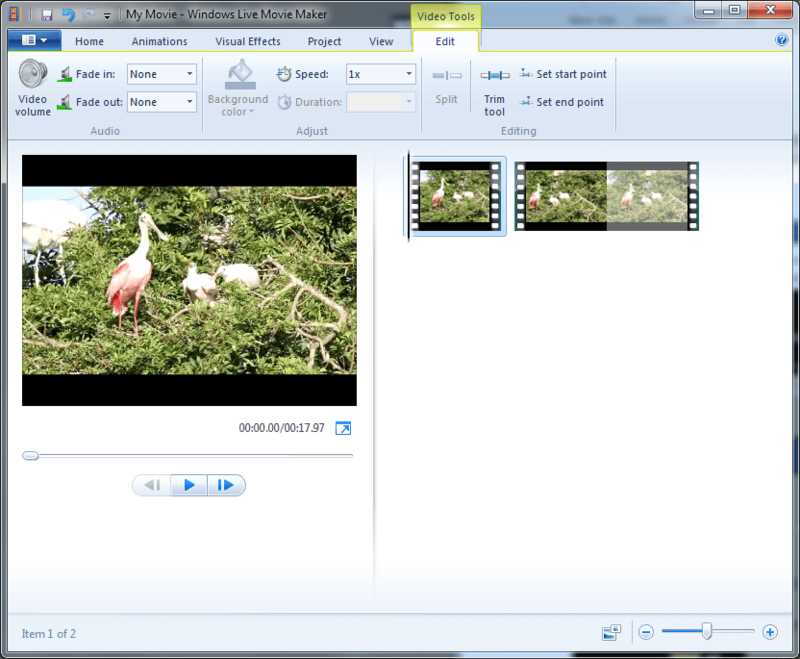 I remove the blurry parts, or trim the videos to include just the major birdie action. Save the movie as a .wmv file for upload to my website. In doing this, I downsample it to limit the file size (and the download time for my viewers). Watch your video and choose which parts you like and which parts you’d like to edit out. My videos often have a few seconds of blur at the beginning, when the camera was acquiring focus. (The Live View and video focusing in Canon DSLRs takes an alternate image processing path through the camera, allowing focus in lower light, but it takes longer than the usual still shot focus. So a few blurry seconds is normal.) So for the sake of this tutorial, let’s assume that you want to remove the first few seconds and the last few seconds of the video. Go to the Edit ribbon pane. Find the beginning frame. You can hit and buttons to get to the beginning frame, and then refine with the and buttons, which allow you to go backwards and forwards one frame a time. You can also drag the progress bar slider to move forward and backward in the video. On the Edit ribbon pane, click Split . This marks the current frame as the beginning frame of a clip. Note that on the right side of the screen, your video is now split into two separate parts: the part before this frame (that we want to delete), and the part after (most of which we’d like to keep). Now find the ending frame of the clip that you want to remove. Push and then again, or use the button to move forward. On the Edit ribbon pane, click Split again. Again, on the right side of the screen, note how your video has again split at the position that you indicated. You now have three video clips: the beginning, middle, and end. Note that you haven’t done anything destructive yet, like deleting a clip. 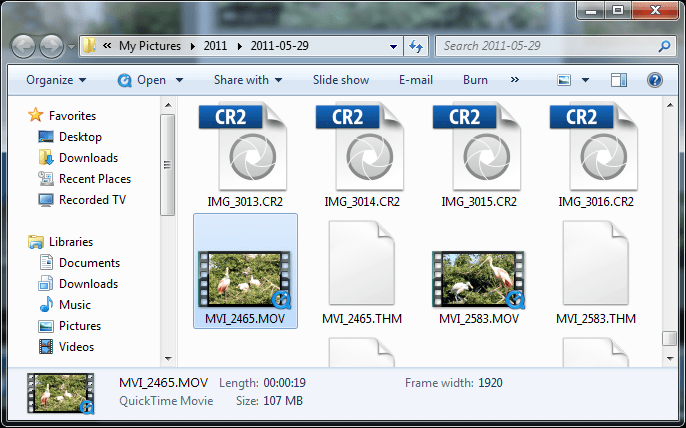 If you were to save your movie as it currently is, the program will merge all these clips together seamlessly. So don’t worry if you split the movie a few times too many. To remove a clip, move to the storyboard on the right side of the screen. Click on the clip that you want to delete. It will be highlighted. Then hit Delete on your keyboard. So for our example, click the first clip and delete it, then click the last clip and delete it. You will be left with the middle of your video, the “keeper” portion. Sometimes somebody is talking during my video, and to keep their conversation from being shared on the Internet, I mute the sound on the movie. Or sometimes the birds were chirping really quietly, so I turn up the volume. It’s easy to change the volume. 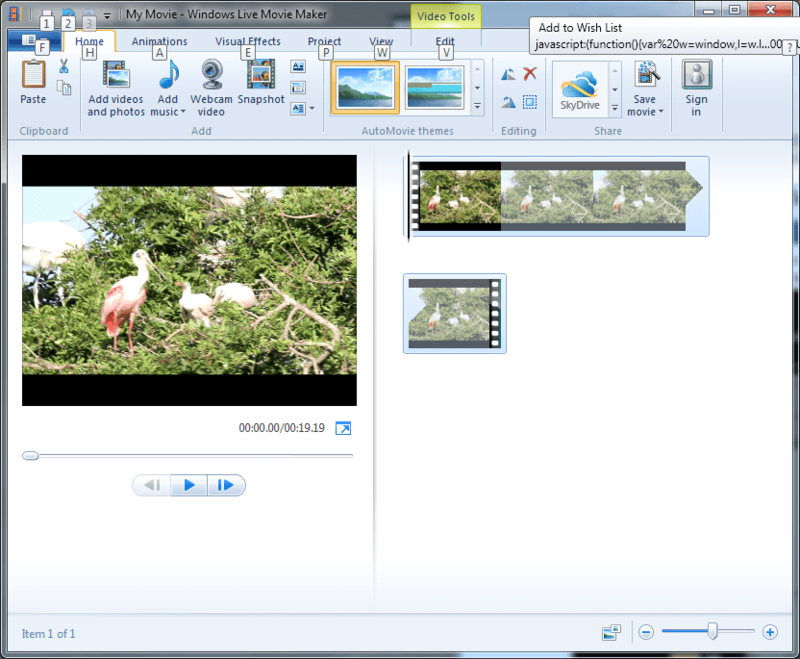 Click on the clip that you want to change, go to the Edit ribbon pane, then click the Video Volume button. A slider will appear, allowing you to turn the sound up or down. Moving the slider all the way to the left mutes the video. If you upload your raw HD video to the Internet, be prepared: it’s huge, and it will take a long time for you to upload, and for others to download. It will also take up a ton of space on your webpage server. I almost always downsample my videos before I upload them. 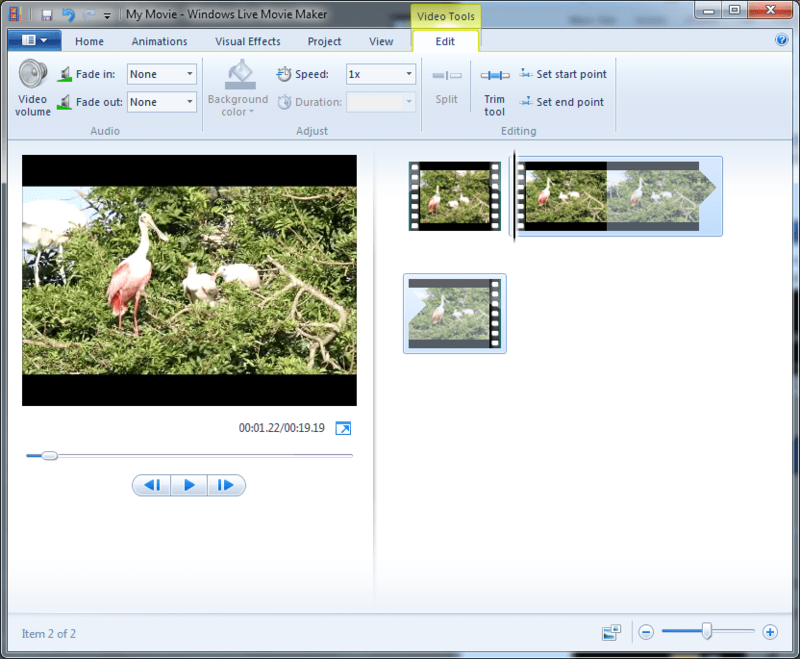 Movie Maker makes this very easy for you. For high-definition display: This saves a full HD video, which is pretty big. Use this option if you want to play the video back on your computer, or burn it to a DVD. For email: This makes the video frame size small, and a 30 second clip is generally less than 10 MB (my limit for uploading to my website). If you have multiple movies that you want to combine, open all of them in Movie Maker. They will appear in the storyboard one after another, each as a separate clip. You can click and drag them to order them. Then when you push Play or save the movie, they will all be saved together into a single merged movie. Click on the Edit ribbon pane, then under Fade In and/or Fade Out, select Slow, Medium, or Fast. This will cause the selected clip to have a fade transition at the speed that you select. For fancier transitions, click on the Animations ribbon pane, then experiment with the Transitions options. You can make your clips dissolve or zoom in various ways. Thanks, Jess. This was very useful.